Adam Levine is going to the Super Bowl! 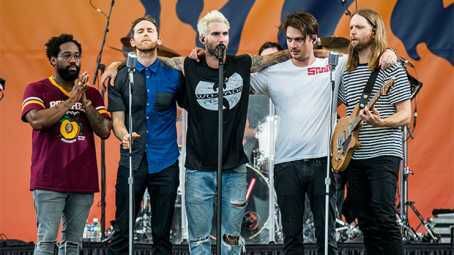 Even though the NFL season has JUST started, Maroon 5 has reportedly been booked to perform at the big game. Seriously, we’re less than a month into the 2018-19 NFL season, so it’s practically impossible to know which two football teams will go head-to-head on the field of the Mercedes-Benz Stadium in Atlanta for Super Bowl 53. But, we reportedly know who’ll play the Halftime Show, as two sources confirm to Variety that Maroon 5–Adam Levine, 39,Jesse Carmichael, 39,Mickey Madden, 39,James Valentine, 39,Matt Flynn, 48,PJ Morton, 37 and Sam Farrar, 40 – will perform in the middle of the NFL’s biggest game on Feb. 9, 2019. This follows an early report from Us Weekly, where a source told the publication the “offer has been extended and they’ve pretty much accepted.” We’ll update this post upon confirmation, or if we hear any other news about this report. Is this the earliest that the NFL has reportedly picked a Super Bowl Halftime show performer? With just under five months until the big game rolls around, Maroon 5 will have plenty of time to plan the biggest music spectacular EVER. They have some big shoes to fill. The last time a band was tapped to play the Super Bowl, it was Coldplay, who happened to bring out Bruno Mars and a just a singer named Beyonce. Guest appearances are a key feature of the Halftime show —Katy Perry brought out Missy Elliott, Beyonce reunited Destiny’s Child, and Justin Timberlake controversially performed with a Prince“hologram” in 2018, just to name a few. So, who could Maroon 5 bring out? Well, the rockers have found some chart success thanks to their collaboration with Cardi B,so they could perform “I Like It” with Ms. Almanzar. Plus, with the Super Bowl being in Atlanta, one of the centers of hip-hop and the home of Migos (aka Offset, Cardi’s husband) it seems like Maroon 5 would be nuts to NOT include her. If they can’t get Cardi, they can call up any of the people they recently collaborated with. They’ve teamed with Kendrick Lamaron “Don’t Wanna Know,” and withSZAon “What Lovers Do.” They’ve also collaborated with Wiz Khalifa, Christina Aguilera(“Moves Like Jagger” would be a banger for the Super Bowl, right?) Rihanna, and ASAP Rocky during their career. Looking over their career, Maroon 5 could actually be a decent Halftime show if they make sure to invite all their friends.